One of the biggest challenges for so many small businesses and non-profit organisations is getting the right capacity building and business development advice in the early years to ensure long term sustainability. That is where Andrena Sawyer and her company, P.E.R.K. Consulting, come with the right solutions. LoA learned more about this high impact advisory firm on a mission to make a real difference from founder Andrena Sawyer. P.E.R.K. Consulting is an advisory firm that specializes in business development and capacity building support for nonprofits and small businesses. Our services include business & nonprofit registration, business plans, staff & volunteer training, strategic planning, grant & proposal writing and more. Our commitment to each client's success is not just for a project, but also for developing long-term relationships that serve their ongoing needs. Whether an organization is at the inception stage, or looking for some guidance for implementing program ideas, our business development strategies support each client in applying a systematic approach for internal organizational projects, as well as large scale community initiatives. I was inspired to start P.E.R.K. Consulting (P.E.R.K.) based on an observation that while nonprofits create tremendous social impact and change, their lifespans are often cut short due to being underfunded and underdeveloped. By starting P.E.R.K., I envisioned a thriving and affordable advisory firm equipped with experts and resources for promising entities. Over the years, the idea has evolved to include for-profit services. We have grown from a one-woman operation to a team of nonprofit and small businesses professionals that have worked with hundreds of small businesses and nonprofits since our launch. We have created a unique business model that not only puts clients first, but we have incorporated our commitment to community development in our operations with two signature programs--the NextGen Scholarship for international students, and the Pro Bono program for deserving, but underfunded organizations. This allows us to use a percentage of our profit to give back to our local community. When clients use our services, they not only receive high quality support, but they become part of our philanthropic efforts. “Get real.” I’d lost track of how many times I was offered that advice, unsolicited, and in so many words. In 2012, I was 25, close to broke and smiling as I reported that I was quitting my full-time job to start my own business. The truth was that I couldn’t blame my friends and family for questioning my sanity. There I was, January 2012, resignation letter typed out, but dated for August 8, 2012. I knew that I had some serious planning to do if I was going to follow-through with what I’d just written. In my excitement, I’d shared my plans with several people, and the fear of seeming flighty left me no choice but to actually follow-through—no matter how scared I was on the inside. When August 8, 2012 came around, I stared at my bank account and did the mental calculations of how long it would take before I went running back with my tail between my legs. When I realized that I wasn’t quite as ready as I thought I was, I swallowed my pride and stayed on the job. It was then that I learned my first lesson about entrepreneurship—you can only put off the inevitable for so long. 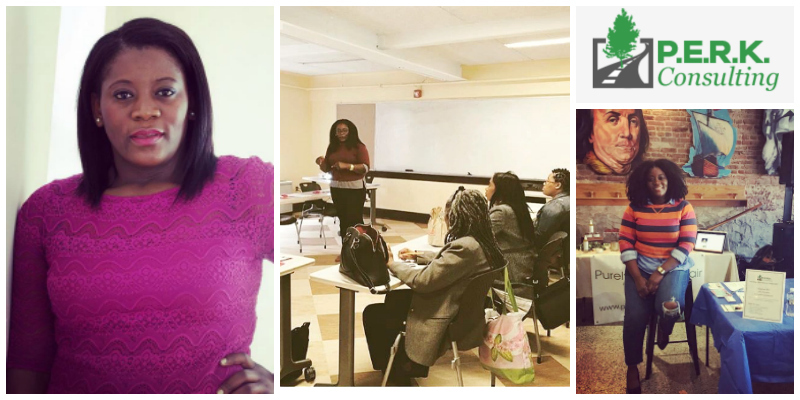 One month later, on September 9, 2012 I walked away from my position to start my company, P.E.R.K Consulting. 4 months later, I had my official launch party, and it was in that moment I knew there was no turning back—or at least, it would be very difficult to do so. I never actually wanted to be an entrepreneur. I’m often asked the question, “are entrepreneurs born, or are they made?” My response is always, “both,” because I see traces of both in my own life. My father is an entrepreneur. All my life I have watched him create. There is something in him, even after having a business that failed, that itches for the freedom of building and creating. I blame (credit) him for passing that on to me. My mother is what I call a “wishful entrepreneur.” She has unlimited creativity, and is quick to identify the need to be solved—a key trait for entrepreneurs. However, she’ll be the first to tell you she values the stability that is often difficult to come by in the entrepreneurial journey. I blame (credit) her for the made part. Watching them—the hustle and the uncertainty—made entrepreneurship something left to be desired. However, seeing the growth of a company I started in the living room of my one-bedroom apartment, which is now in 3 cities across the United States, gives me much pride and joy. Following through on my dream one of the best decisions that I’ve ever made, primarily because I get to help others follow through on their dreams. P.E.R.K. Consulting (P.E.R.K.) specializes in three core services—entity formation, strategic planning and business development. When I started P.E.R.K., I was content with being an independent contractor working with a couple of nonprofit organizations at a time. However, the idea evolved faster than I could adapt. After developing several arms of the business, it quickly became evident that P.E.R.K. could no longer remain a one-person operation. Within a year and a half, my independent consulting project, that allowed me to work from home, became a small business made of nonprofit and small business professionals. It’s been over 6 years since P.E.R.K. officially launched. Like most entrepreneurs, I've lost a lot in the process, but I have also gained an incredible amount. I have been the recipient of numerous business awards and recognition. I have been featured in magazines, newspapers, blogs and media platforms. I have met and worked with some of the most influential people of my generation. I have been trusted to speak to audiences that I would not otherwise have access to. Our growth as a company is no longer just a dream. There are tangible and measurable successes. I have gone from working with 2-3 small clients at a time, to managing a team that can handle the solo-entrepreneur as well as a project with a government agency, or the local university. We have gone from a couple of workshops and training sessions annually, to over 100 workshops (and increasing) each year. During a candid conversation with my father, he once told me “remember who you are.” He was reminding me that my core values, contributions, abilities and skills matter. That advice has guided my business practices. It has shaped P.E.R.K's core values—Passion, Experience, Relevance and Knowledge; it affects the initiatives that we create—including our annual scholarship award; and it influences the company culture that we are creating both internally and externally with service provision. I don’t do what I do with P.E.R.K. for the recognition. I am motivated by the fact that I finally found my passion as an entrepreneur. Be persistent. As cliché as it sounds, do not give up. Entrepreneurship can be extremely stressful, and you may initially encounter a lot of rejection. Do your due diligence by ensuring the idea is viable. Get the support of trusted mentors and advisers, and push through the challenges. The reward is great.